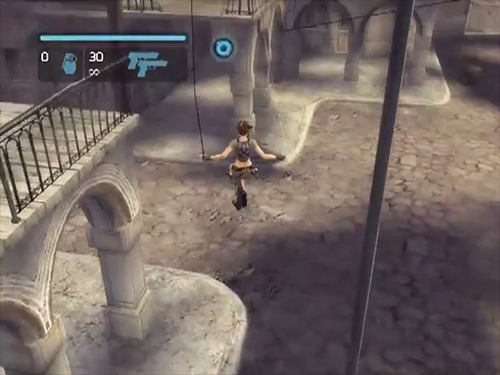 There is nothing important to do at the beginning of this level, just roll (or swan dive forward along the street, as shown here) until you reach Anaya, that way Lara will cover more ground than usual. Since you need to kill everyone in the courtyard in order to to continue, I suggest running toward one of the first enemies and shooting. 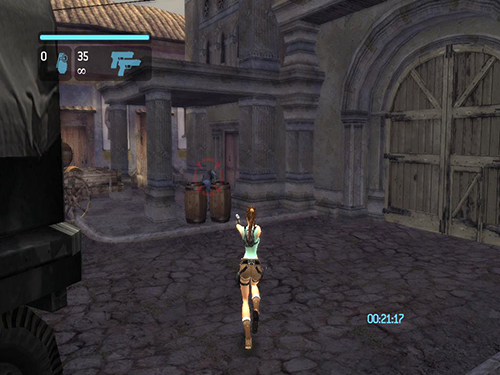 After one is dead, take his weapon and start using it. Along the way you will collect more ammo. Use the exploding objects when you can. If you haven't unlocked the one-shot kill cheat, it's also a good idea to use the "Aerial Attack" (i.e., headshot) as much as you can. 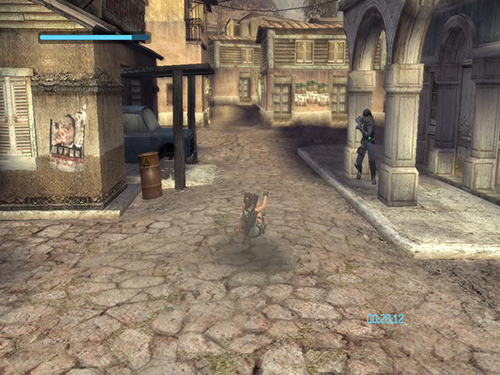 Once you reach the other side of the town, there is no need to kill enemies here. 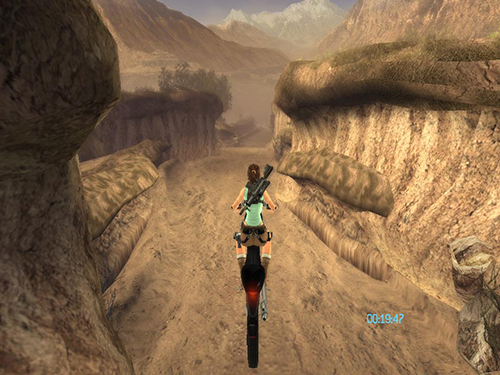 Just roll all the way though until you reach the trigger for the motorcycle cutscene. 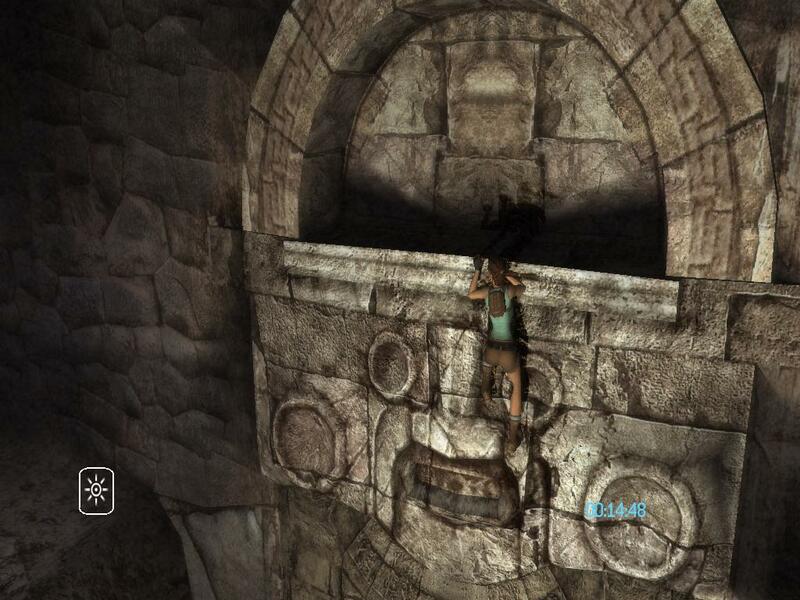 Lara should only take a few hits while rolling. There are no specific tips for this part. The only things I can suggest are to pick up and use health packs along the way, since you can lose a lot of time if Lara dies, and shoot all the enemies as quickly as possible. Do not try and get ahead of them; you must kill them all in order to advance. 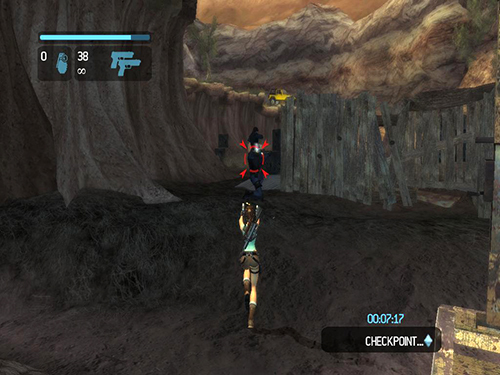 There are only three checkpoints in this area. One at the beginning, one at the bridge and the last one before the end of the run. Dying here can cause you to lose a lot of time, so obviously you should try not to do so. Rolling through small holes is better than crouching, make sure to do that. If possibly, try and jump across the pits and grab the edges. If you can't manage this, at least be sure to tap Interact to climb faster along the poles. At this point, ignore Amanda. 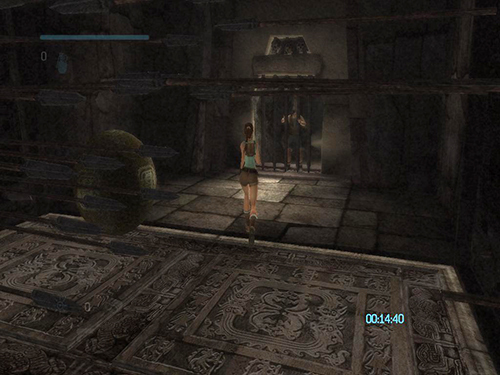 There is no need to trigger the scene where she is creaming and Lara saying "What's happening, Amanda, can you hear me?" 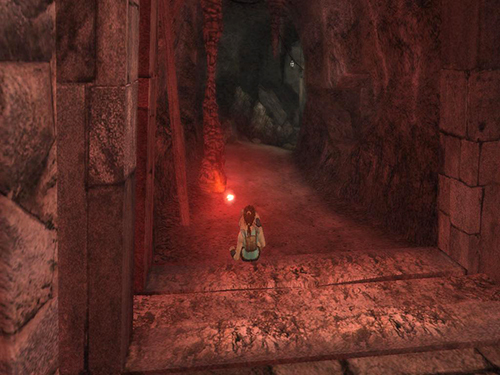 Just continue through cave where you need to go. 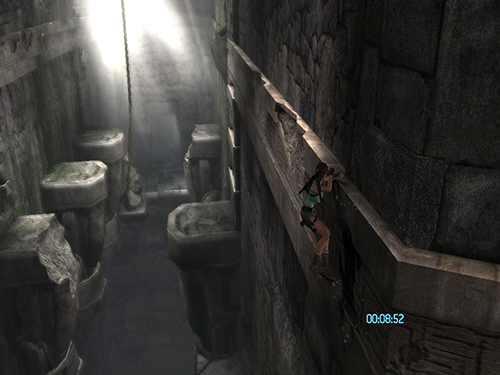 Again, make sure to tap Interact to "Fast Traverse" when Lara is on the wall. Just as you did with Amanda, ignore Kent as well. They will talk, but you just focus on your goal here and don't let it distract you. 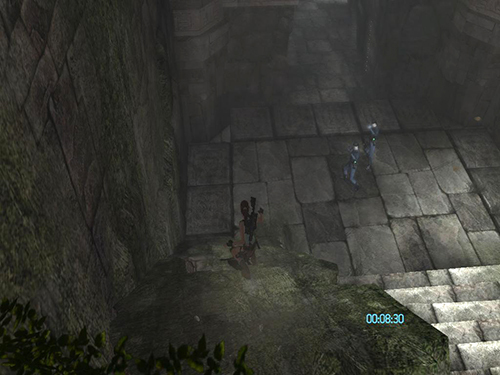 At the point where Lara sees Amanda again, there is no need to stay and listen to their conversation, just continue on. 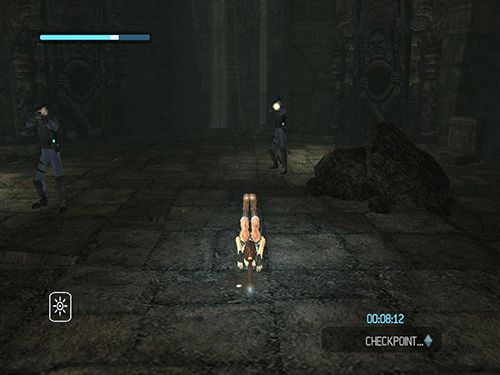 In the final hall before the end of this part, roll forward to cover more ground, since there is not much to do here. 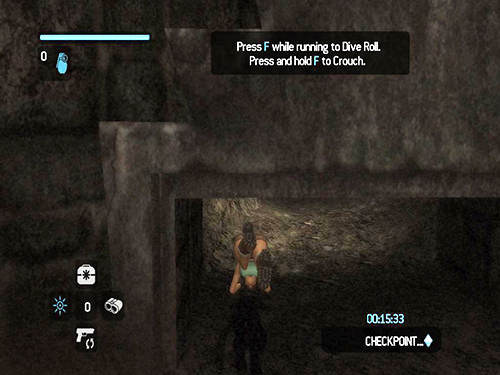 After the flashback, when re-entering the ruins, swim directly to checkpoint 14. (Tap Interact to swim faster.) 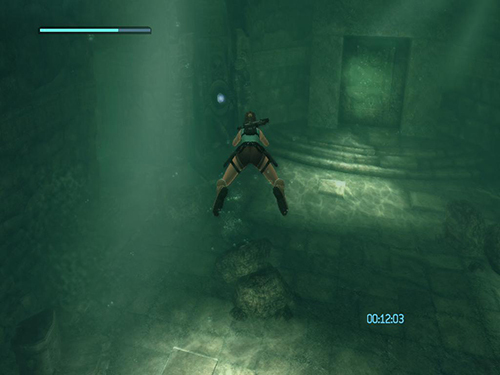 You may be able to make it to the air pocket above the blue lights, but even if Lara drowns just beyond the checkpoint, and the game reloads, this is still faster than swimming up the vertical shafts for air. 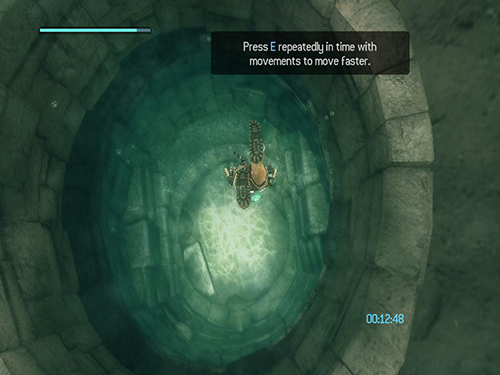 If you followed this strategy and died at the checkpoint, continue on without swimming up for air. 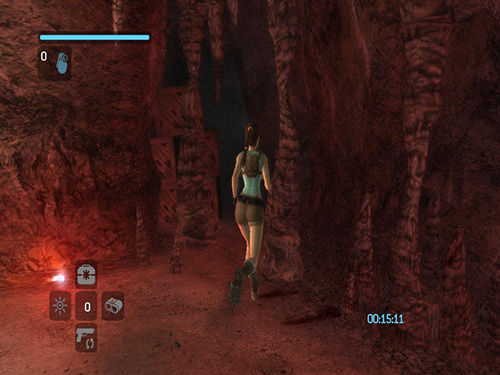 If you move fast, you will be able to activate all the blue lights, and Lara will only lose a small fraction of her health. This is still better than losing time by going to the surface. When using ladders, tap Interact to climb faster. 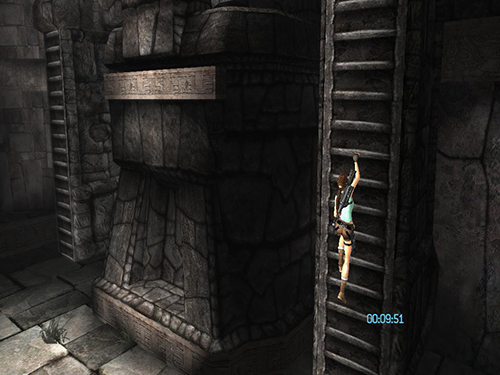 On the way back make sure to "Fast Traverse" when Lara is on the wall and be careful when reaching the rope. It's better to take a few moments to jump carefully. 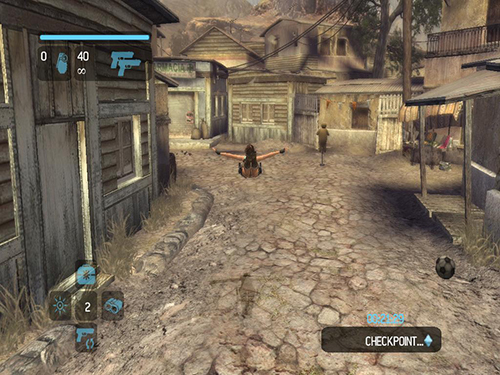 If you die, the game will reload at the last checkpoint and you will lose a lot more time. Just ignore the enemies here and roll past them. Ignore them here as well. They will shoot you once or twice, but nothing too dangerous. 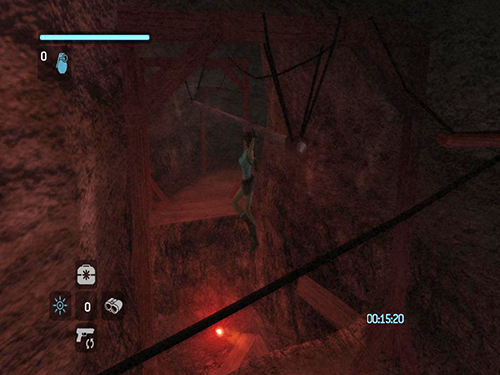 Just go straight to the rope and make your escape without killing them to save some time. 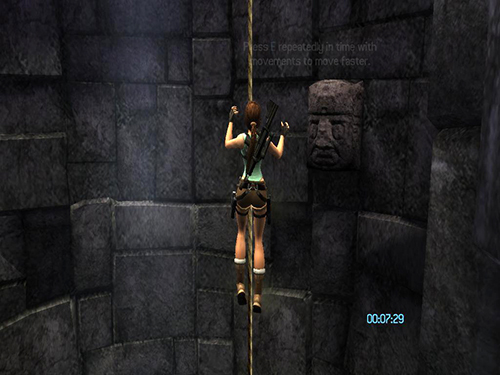 When climbing the rope, tap Interact to climb faster. If you've done everything well up to this point, you should have a lot of time to kill the last group of enemies. You can use your own strategy, but mine is to use the headshot as much as you can and try to avoid grenades, because even one can kill you if your health is not full. 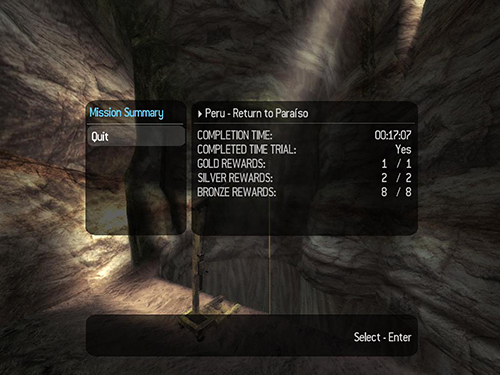 Still, even if you die you should have time to finish this level.